TweakTown visited InWin at Computex and got to see the H-Frame, a unique case prototype that features an open air design. The front and the rear of the case are open, they consist of panels with a small gap between each panel to allow for air to freely flow in and out of the case. InWin told us in their testing that some system configurations do not even require a case fan due to the open air concept of the H-Frame. As you can see from the photo above, the front of the H-Frame features two USB 3.0 ports along with audio as well as the power and reset buttons. We really like this design and while it won't be for everyone, at least InWin has the big bits down stairs and is prepared to try something new entirely. We'll have our review for you soon enough. 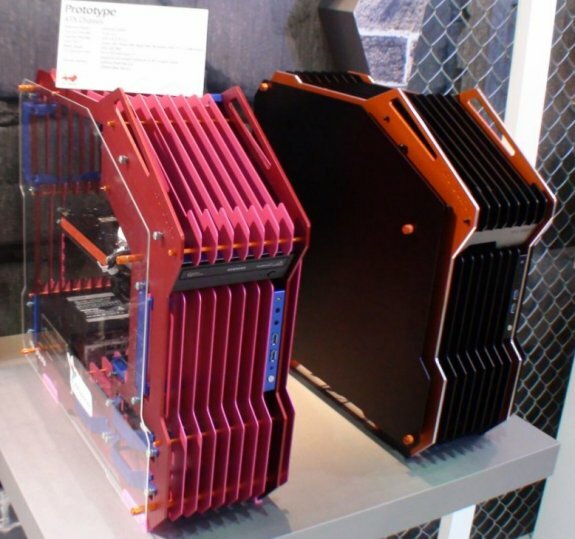 It's a shame though that InWin picks such flashy colors for this case, the company had a pink/orange version on display as well as a black/orange model. Each version can be shipped with a regular closed side panel or a full window side panel.